2. 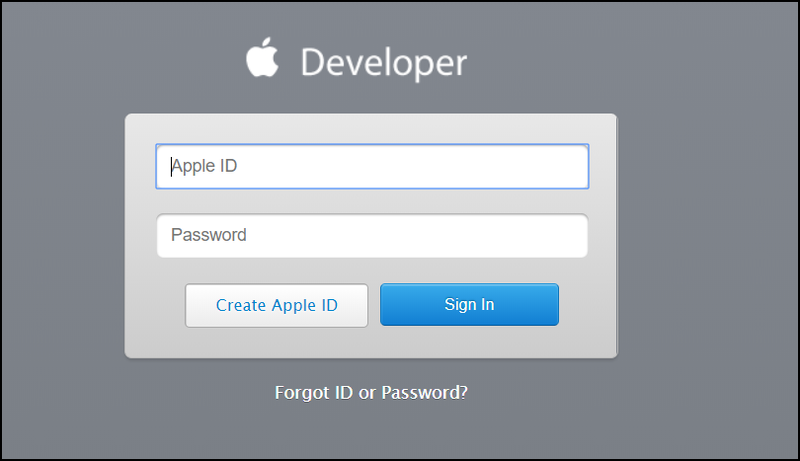 How to create an Apple Developer Account? To publish an app on the Apple App Store, you first need to get an Apple Developer Account. Let us mention upfront that Apple demands $99 every year for a developer account. 1. First, go to https://developer.apple.com/programs/ and click the Enroll button on the top right corner of the page. 2. On the next page, click the Start Your Enrollment button. 3. You need an Apple ID for a developer account. Therefore, the next screen will ask you to log in with one. If you don’t have it, click on Create Apple ID button. 4. In this step, Apple will ask for your personal information like name, surname, birthdate and email for creating your Apple ID. Make sure that the email you use as your Apple ID is a safe one that won’t expire or be lost. That’s because all the communication between you and Apple will happen over this email address. 5. When finished with entering your info, click Continue. You will receive a verification code and the screen will prompt you to type it in. You need to verify your account by using this code. Check your inbox for the email address you have used as your Apple ID to find the activation code, and click Continue on the dialog box where you have entered the code. 6. Now, you will see the Apple Developer Agreement. Tick the boxes under the agreement and click Submit. 7. In this step, you need to choose your account type. Go to https://developer.apple.com/enroll/ and choose the entity type as an individual or company. Then click the Continue button. 8. Before the payment session, Apple may ask you to confirm your Apple ID. Two-factor authentication is designed to stop others from logging into your account even if they get your password. With two-factor authentication, your account can only be accessed through trusted devices like an iPhone, iPad, or Mac. Before developing the two-factor authentication, Apple used to provide another technology, the two-step verification. You can use Apple’s support document to learn which one is active in your account, and take the necessary steps, if there is any. At that stage, if two-factor authentication is turned on for your Apple ID, Apple will send a verification code to your mobile phone. After you enter this code, you can click Continue and proceed to the next step. If two-factor authentication is not turned on for your Apple ID, you can activate it by following the steps below or looking at the Apple’s support article. 9. If you’ve passed the Apple ID confirmation steps, Apple will ask for your contact information in detail and then take you to the purchase screen. You have to fill out all the required parts in this form and continue. 10. Now it’s time to pay the registration fee of $99. Apple charges this amount annually. Provide the required information and click on Purchase button. 11. Apple may request your User Name and Password again for security reasons. When you complete this data and continue, you will see the payment screen. Fill in your credit or debit card info and invoice address. Then click the Further button. When your payment is successful, your account approval process will start. Apple might request for some additional documents at this stage. If there is no problem with your documents, your Apple Developer Account will be activated and you will receive a membership confirmation mail. If you want to submit your iOS app to the Apple App Store, you need to create a Bundle ID for your app. To learn how to do it, you may take a look at our 3. How to create a Bundle ID? article.